These artworks began to appear in the early 1970's due to Geoffrey Bardon's involvement at Papunya in encouraging Aboriginal people to put their stories on a more permanent substrade so they could be kept for posterity. After a few issues such as protecting sacred information the group of artists grew and grew, until it is now a major industry and an extremely important source of income for Australia's Aboriginal people. Artist groups sprang up in communities all over the country and perhaps the most exciting art movement of the 20th century was born. 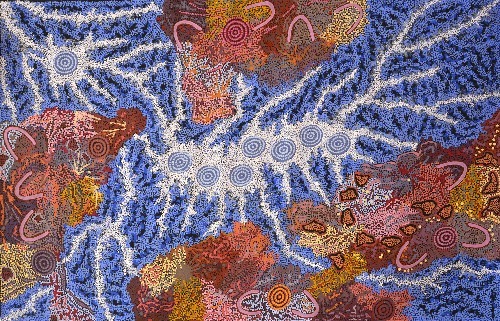 Today, contemporary Aboriginal art is still based to a large extent on ancient stories, but modern materials have made it possible for Aboriginal Artists to paint with a wide range of colours and in the relatively easy medium of fast drying acrylic paint. Many Artists paint outside on the ground, or on verandahs or the floors of open doored studios: dogs, birds, children and family in general mill around, dogs occasionally fight across a painting, and children, dogs (and the artists themselves) may frequently be found sitting on the artworks while they are in the process of being painted. This all makes it virtually impossible for an artwork to be painted in slow drying oils or fragile watercolour – it is definitely not the relatively controlled environment of a western artist. 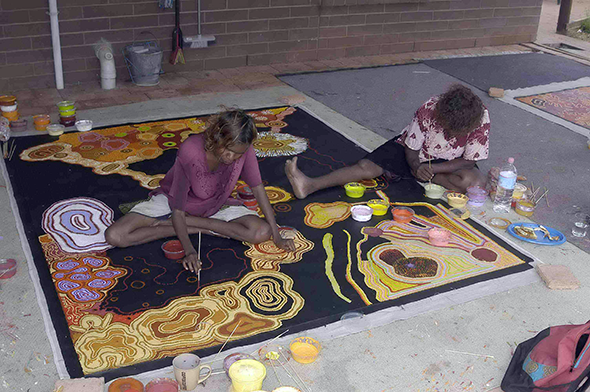 Acrylic paint is up to the test however, and it is a perfect medium for Aboriginal art – it is quick drying, durable, can be wiped clean, rolled, transported, endure harsh temperatures, and all without so much as a blemish or crack appearing in the work. Earlier in the piece however, the use of acrylic paints was questioned. Many queried the fact that Indigenous Acrylic artworks are frequently in such bright and lively colour palettes, asking why they are not in the more 'traditional' Aboriginal colours such as brown, red ochres, yellow ochres and the like. If you have ever been to the outback, especially in springtime after rain, you will see a world of unsurpassed colour. Broad blue skies, red deserts dotted with an incredible variety of greens, coloured rocks and wildflowers of all descriptions, blue, violet, green and orange waters, all make this one of the most colourful places on earth. Even in the harshest of dry summers, the colours of the outback are extraordinary. The main proponent of this medium, and the one to receive most acclaim was watercolourist Albert Namatjira, who painted at the Hermannsburg mission back in the 1930's. Initially he was taught to paint landscapes in this European style by artist Rex Battarbee, but he developed his own unique style and as a result of his technical and artistic ability with the medium, he gained great respect and admiration in his time, despite him being an Indigenous artist. In fact it led the government of the day to give Namatjira full citizen's rights, something that was denied to Aboriginal people at the time. To this day, there are a number of artists who follow in Namatjira's footsteps, largely painting the McDonnell Ranges and other Central Australian landscapes. The works are charming, finely worked, and good examples are quite collectible in their own right. Many Indigenous artists have embraced new technology and new media. In 1988 Michael Nelson Jagamarra designed the mosaic in the forecourt of the new parliament house and has gone on to produce paintings which meld traditional iconography with western abstraction. There has also been an incredible increase in Indigenous artists working with photo media, video and installation.